How Can This Effect Cammodels? Now that Twitter has started to crack down on Russian bots spreading fake news and political propaganda, the adult industry may find themselves winding up as collateral damage. Recently its been noted that foreign agents have used American based social media apps to manipulate and coerce members of the American public into voting for one political candidate over another. After Robert Mueller, the director of the FBI has officially charged several Russian entities with tampering with the 2016 presidential election via social media some platforms are scrambling to make amends. As it turns out Twitter is the latest company to make an attempt to clean up and rid their app of such interference. After the New York Times published an article stating Devumi, a company known for selling twitter followers used for automation and manipulating the algorithm, had managed numbers up to 3.5 million bots for customers. Devumi and other companies placed Twitter in a very delicate situation leaving the platform vulnerable as well as many of it’s users. What is known is that some organizations were able to use automation services to create multiple accounts and bolster political topics in the hopes of pushing a set agenda. By having multiple accounts and tweeting the same content members are able to trick the twitter system and make some topics appear more popular than others, when in fact they were minor news stories that were both baseless and in many cases very damaging. So now going forward Twitter has decide to tackle the use of spam bots and automation on its platform. If you’ve ever purchased Twitter followers hoping that this will make you appear more popular to your growing fans, the chances are you’ve recently witnessed your numbers decreased. Twitter has blogged and warned that these changes were coming since January, but I believe that recent indictments brought forth by the FBI has cause several social media platforms like Facebook and Twitter to take immediate action. The latest purge on twitter bots occurred on Feb. 20th causing some members to wake up feeling the effects of lost followers. Some have said that this was an attack on users with a more conservative views, but as it turns out this also effected people who had purchased followers and were using automation as well. Ultimately Twitter and most other social media apps would prefer that users grow their numbers organically and try to encourage engagement at every turn. Truthfully speaking Twitter can be quite manipulative themselves with it’s constant attempts to access it’s members location and phone contacts. And we all know that this can be a cammodel’s worst nightmare while attempting to market their services. What Exactly Is Twitter Automation? “Do not (and do not allow your users to) simultaneously perform actions such as Likes, Retweets, or follows from multiple accounts. For example, your service should not permit a user to select several accounts they control to follow a specified account.” From the Twitter Blog. What this could mean for cammodels and all other adult industry representatives is the use of some tools like auto tweets from your clipsite dashboard could cause you to be in breach of Twitters terms of service. It could also be an adding factor as to why some accounts are facing the dreaded shadowban. Many cammodel platforms like Clips4Sale, Manyvids, IWantClips and many more provide tools where models are able to auto tweet new clips uploaded to their profiles announcing that it’s readily available for sale. Some of the more progressive camsites and adult content platforms allow for specific scheduling that in many ways resembles Twitters on product Tweetdeck. But now that these changes are soon to go into effect on their own products (TweetDeck), cammers should definitely pay attention to how often they use automation services from adult platforms. My thinking tells me that if they’re willing to make changes for the mainstream why wouldn’t they tackle overly excessive auto tweets with xrated content? 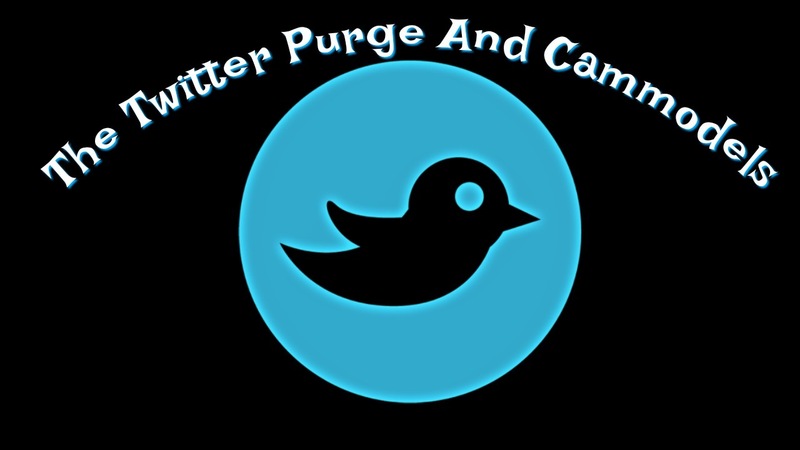 So going forward as a cammodel and adult content creator, I would suggest that creators become more selective when it comes to what sites and tools access your twitter account. Instead of using Hootsuite, TweetDeck and auto tweets from any number of adult clips sites, really think about how useful that tool is to you. Try determining which is most effective and scale down to only that one tool while cutting down on your number of auto tweets as well. It’s important that you appear to use the platform for real time engagement and not just for the purpose of spreading spam. This I believe is where many people have gone wrong and found themselves being categorically aligned with spin doctors and political pundits, when all you really wanted to do is show off your latest twerk video. So if you don’t want to be confused with the latest twitter purge meant to delete bots used to game the system and spread false narratives, try using your account organically. Find other cammers to engage with and those with common interest. Once of my favorite things to do is live tweet during my favorite tv shows. I’ve found that this increases my engagement and puts my profile in front more users versus dropping tweets void of any originality or personality. If you’d like to learn more about how to be more engaging on twitter and how to enhance your interactions please follow us @BoleynModels.